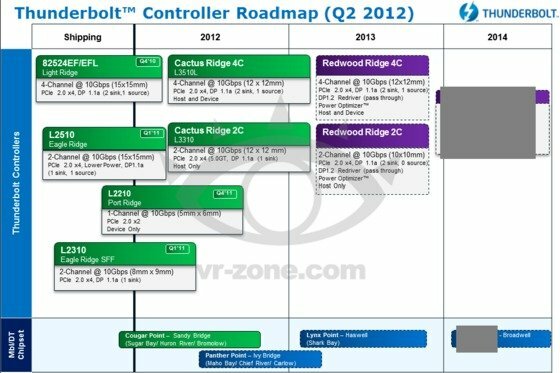 VR Zone got its hands on a roadmap of Intel's Thunderbolt controllers, you can learn all the details over here. We already know what Intel has planned for this year when it comes to its Thunderbolt chips, but VR-Zone has managed to get hold of an updated roadmap covering what to expect for 2013 and we'll even give you glimpse at what Intel has planned for 2014. Intel is set to continue its strategy with two different solutions, but the company has decided to add a few new features and we should be able to expect lower cost for Thunderbolt in the future as well.